Today I’m sharing recipe 2 from my Vegan Series: vegan kibbeh with swiss chards. Kibbeh, which is generally made with ground meat and bulgur wheat, is a way of life for Syrians. They eat it fried, grilled, raw, in sauces, and in an endless variety of shapes. It’s no surprise that during Lent, where Orthodox Christians refrain from consuming animal products, Syrians came up with another meat-free method to this delicacy. I got this recipe from a close family friend who is Orthodox Christian. The dough is made by combining bulgur wheat, semolina and a bit of flour. The filling is made up of swiss chards (or spinach), crunchy walnuts, tangy pomegranate molasses and a bit of Aleppo pepper paste for some kick. 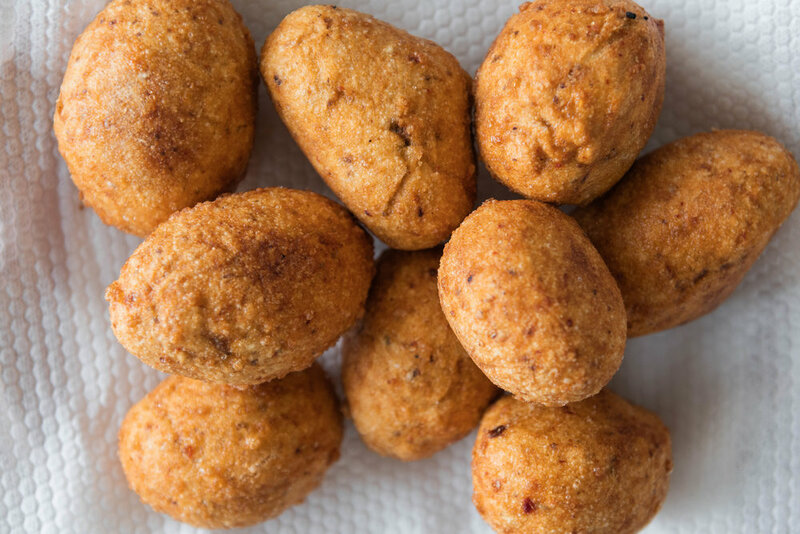 Once stuffed, the kibbeh balls are deep fried until crispy and delicious. When these were gone (which was fast), I was so sad. They’re a perfect snack or side with salad. My muhammara, which is another great vegan dish, would go wonderfully with these fried morsels. If you give it a try, don’t forget to put it in the comments and tag #omayahcooks or @omayahatassi on Instagram! P.S. I have a stop motion for you! But I’m having some technical difficulties with iMovie. I’ll update you when I post it! Dough of fine bulgur wheat, semolina, flour and ground coriander stuffed with swiss chards, caramelized red onions, walnuts, pomegranate molasses and Aleppo pepper paste. Sub Turkish pepper paste if you can't find the Aleppo variety. Place the chard leaves in a dry pan over low heat. Working in batches, sprinkle with a pinch of salt to draw out the moisture and wilt. Squeeze dry and set aside. Wipe the pan clean. Heat the vegetable oil over medium heat and add the red onions. Cook until soft and beginning to turn golden, about 15 minutes. Add the pepper paste and chard leaves and continue cooking until combined, about 2 minutes. Add the seasoning and walnuts. Take off the heat and add the pomegranate molasses, lemon juice, sugar and salt. Adjust seasoning and set aside to cool. To make the dough, soak the bulgur for about 20 minutes. Drain and squeeze dry. Prepare a bowl of ice water. Combine the bulgur with the semolina and flour the bowl of a food processor. Process until a dough begins to form. Tip into a large bowl and add seasoning. Wet your hands slightly with the cold water and knead the dough until fully combined, about 3 minutes. When dough is ready and filling is cool, take about a 1/2 inch-1 inch ball of dough. Hollow it out by pressing your index finger in the middle and pressing the dough into your other palm. Keep turning the ball of dough in the palm, pressing, until the dough is thin and an open pocket is formed (probably thinner than what's pictured above). Add a spoonfull of filling. Dip your fingers into the ice water and begin smoothing the dough to close and form the desired shape. Dip your fingers in the ice water again if you need to smooth the dough more. Continue with remaining dough and filling. Heat enough oil in a pot to cover it by about 1 inch. The oil should reach 350 degrees F or until a piece of pita bread is dropped in and immediately begins cooking. Fry the kibbeh balls until golden and crispy, about 5-10 minutes, depending on the size. Drain on paper towels. Store in an airtight container in the fridge up to 5 days. Reheat in the oven before serving.